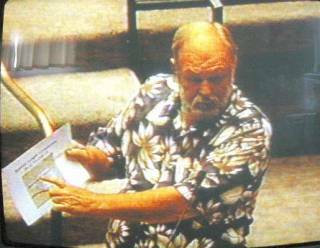 (October 5, 2003, 5:40 p.m.) -- An FAA certificated pilot, who tried to show LB Councilmembers why they should not approve a main runway rehab plan that includes some diversions of large jet aircraft onto shorter runway 25R/7L, was blocked by Mayor Beverly O'Neill from using the Council chamber's visual equipment to display maps supporting his testimony. The Council went on to vote 6-2 (Reyes-Uranga and Webb dissenting, Lerch absent) to approve a main runway rehab plan that will result in the diversions. Larry Mebust, who has over 17,000 hours of incident free flying experience although he doesn't pilot large jets, acknowledged large aircraft can use 25R/7L if they carry lighter loads and fewer passengers but said this effectively requires virtually flawless performance with little room for misjudgments. After Mr. Mebust completed his verbal testimony (without his visuals), 8th district Councilman Rob Webb called his presentation "compelling." Mayor O'Neill said he was "well informed." And Airport Manager Chris Kunze acknowledged that Mr. Mebust had "raised important issues" and "did an excellent job"...although Mr. Kunze offered a different perspective. 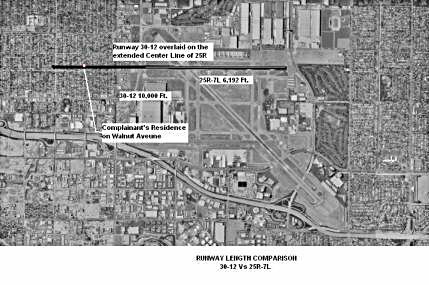 Mr. Kunze said runway 25R/7L meets all federal standards, is certificated under federal air regulation part 139 as an airline alternative runway, is longer than John Wayne Airport's main runway [491 feet longer] and said it is not an unsafe operation for large aircraft. In recent months, some large jets been temporarily diverted onto 25R/7L when LB Airport officials temporarily closed main runway 30/12 for emergency pothole type repairs (one reason for an Airport planned rehab of runway 30/12). The diversions onto shorter runway 25R/7L send large jet aircraft over miles of residential areas at low, loud and some believe risky levels. On Sept. 23, city management sought and got Council approval to award a contract to rehab main runway 30/12 on a schedule that it said will send large commercial jets onto runway 25R/7L on seven and possibly eight Saturdays in summer 2004...and possibly in overnight hours for a period spanning roughly a year if -- despite Airport efforts -- unscheduled arrivals and departures occur between 11 p.m.-6 a.m. when main runway rehab work is scheduled. The Council item was agendized as "Adopt Plans and Specifications No. R-6607 and Award a Construction Contract to Griffith Company and a Construction Management Services Contract to DMJM Aviation, Inc., for Improvements to Runway 12-30, Connecting Taxiways and Runways, Signage and Lighting Improvements, and Associated Airfield Improvements (District 5)." Mr. Mebust prepared a power point presentation with maps supporting his testimony. He told LBReport.com that prior to coming to the Council meeting, he checked with his Councilmember's office (Reyes-Uranga) and double-checked with the City Clerk's office, which referred him to Mayor O'Neill's office where he was told three-minute public speakers are not allowed to use the Council's visual equipment. There is no City Charter or Municipal Code provision saying this. Previous Mayor Ernie Kell did not try to interfere with public use of the visual equipment. More recently, then-Vice Mayor Dan Baker let members of the public use the visual equipment during a Council meeting he chaired in Mayor O'Neill absence, which dealt with the Scherer Park issue, in the interest of presenting a full record and having a fair debate...even though Baker himself respectfully disagreed with the proponents' substantive position. At the Sept. 23 Council meeting, Councilwoman Reyes-Uranga asked about the policy and the Mayor accurately answered, "Actually, I made that decision. If you'd like to change it, we can certainly bring it to the Council, but it was causing some congestion and also there were some things that were brought forward that were not appropriate." Councilwoman Reyes-Uranga replied, "I think maybe there are some guidelines that we need to revisit that and take a look at it." One section of the Council-enacted Municipal Code says only that "The Mayor, or other presiding officer, shall have general direction of the Council Chamber." Mayor O'Neill's decision -- practiced with without any dissent from the Council until now -- has prevented the public from using the visual equipment except when the speaker is an appellant in a formal hearing. The policy gives city officials and those whose messages it approves the advantage of presenting graphics to support their positions...while members of the public with other viewpoints are correspondingly disadvantaged. However, after Mr. Mebust completed his verbal testimony, 8th district Councilman Rob Webb called his presentation "compelling." Mayor O'Neill said he was "well informed." And Airport Manager Chris Kunze said Mr. Mebust had "raised important issues" and "did an excellent job"...although Mr. Kunze offered a different perspective than Mr. Mebust. Responding to Mr. Mebust's point that 25R/7L requires maximum performance take off and landing for every jet aircraft operation, Mr. Kunze said, "In response, aircraft will use the same exact procedures for 25R as they use for 30. The only difference is that they have to take some payload penalty because there is less runway available." Mr. Kunze added, "A point is made that 25R is less length than runway 30 is, and it's about 2/3 the length. This is an accurate statement. However runway 30 is a very long runway. I need to make the point that runway 25R is longer than John Wayne Airport's runway and they accommodate 767 heavy widebodied aircraft, 757, transcontinental operations on a daily basis. A point was made in the presentation that there's no end of runway clear zone to accommodate emergency situations. Our runway safety area meets FAA safety standards for runway 25R as well as runway 30." LBReport.com posts extended excerpts below. LBReport.com also posts a graphic, re-created digitally by Mr. Mebust illustrating the substance of what was blocked from public presentation at the Council meeting. Since the construction of the improvements to Runway 12-30 will require its closure, various construction phasing plans and methods were analyzed to determine the optimum construction phasing. Factors examined for each phasing plan included safety, cost, availability of materials, quality of the completed project, minimizing the disruption to normal operations, and weather. The plan determined to best address these factors is one that will combine night work with some select weekend work. While much of the work will be accomplished at night, with the runway being opened to traffic each morning, seven weekends (plus an eighth contingency weekend to be used only if weather or national emergency prohibits construction on one of the seven weekends) have been provided in the plans and specifications for construction on the runway. These weekends are in July, August and September of 2004. During these weekends, the runway will be closed from 11:00 p.m. Friday night through 7:00 a.m. Sunday morning. During these hours, air traffic that would normally land on Runway 12-30 will be diverted to Runways 7L-25R and 7R-25L. ...In accordance with the California Environmental Quality Act, Categorical Exemption CEP 896-02 has been issued for this project. When the clerk called the item, Mr. Mebust was the only person who came to the podium to speak. Our extended excerpts below are unofficial, prepared by us. Not all speakers or their comments are included; ellipses indicate deletions; bracketed material is by us for clarity. Mr. Mebust: [indicates he lives in Cal Hts. area off the west end of runway 25R] ...There's language in the plan, it's the scheduling plan for this contract, that will cause air carrier traffic to come directly over my house, and at very low altitudes by the way. ...I made a nice power point presentation for you. I'm disappointed that as a fifty one year citizen of this city, I can't use the power point. ...I'm against any use of 25R or 7L for air carrier traffic, period. It's not safe. ...The real bottom line is, it's real simple. An air carrier aircraft can be made to operate at that length of runway, 25R, by taking people and fuel off of it until it matches in the book what's called an accelerate-stop distance for that length of runway. You can do it, but what you create is a 100% max performance requirement on that pilot. This is totally unfair to the people flying those aircraft. And what that means is, if the man makes an approach to that runway, [if] he misjudges it by say four miles an hour he's going too fast, he's off the end of the runway. Those airplanes are going about 195 feet a second at touchdown. If he's going too fast, he's going to slide five or six hundred feet, or another thousand. My little airplane, ten miles an hour too fast, one thousand extra feet to touch down. You've taken absolutely all safety out of the operation there. So it's totally unfair to the pilots. I'm going after this strictly on safety. It's just not been thought through. We had a real treatment here a couple of weeks ago in that runway 30 was closed [for emergency repairs] and they had to use 25R. I have never been afraid of an airplane, but I really thought I was going to get hurt. I looked up and saw an Airbus over my house at 300 feet climbing out. That's ridiculous, absolutely ridiculous. And I'm not the last guy that'll be down here screamin', I can guarantee you. Mayor O'Neill: Mr. Mebust, I think we're going to try to answer some of the questions because your red light is flashing. Mr. Mebust: Oh, my red light is flashing, ma'am. You took my color presentation away from me. But [holds up paper printout of graphic he was forbidden from displaying on visual equipment, indicating LB runways] this is runway 30 overlaid on runway 25R. There's my house. The reason for all this extra runway on 30, it's safety. Safety. You can't do it. That's not a jet runway. It should never be used as a jet runway. As a pilot, I bought my home right off the end of a runway, a small aircraft runway. I flew off of that runway for years and years. This is not an answer. Long Beach has one jet runway, and when that jet runway is shut for maintenance, Long Beach is closed to air carrier traffic. You've got to make that a law in this town, period. ...Airport Mgr. 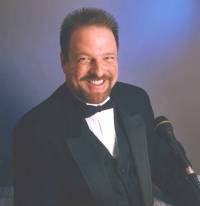 Chris Kunze: ...I've taken notes as best I could on some of the key points. And I think they're important issues raised. He did an excellent job. I'd like to offer a different perspective than he has. ...A key point is that runway 25R requires maximum performance take off and landing for every jet aircraft operation. In response, aircraft will use the same exact procedures for 25R as they use for 30. The only difference is that they have to take some payload penalty because there is less runway available. ...A point is made that 25R is less length than runway 30 is, and it's about 2/3 the length. This is an accurate statement. However runway 30 is a very long runway. I need to make the point that runway 25R is longer than John Wayne Airport's runway and they accommodate 767 heavy widebodied aircraft, 757, transcontinental operations on a daily basis. A point was made in the presentation that there's no end of runway clear zone to accommodate emergency situations. Our runway safety area meets FAA safety standards for runway 25R as well as runway 30. He mentioned that accelerate and stop distances for that runway length are mandated by each aircraft flight manual, and this is correct for runway 25R just as for runway 30. We will accommodate acceleration stop distances for the user based on the aircraft performance and also the weight. There are two variables there. The type of aircraft, some will not be used on Saturdays such as all cargo aircraft, and also there will be weight limitations in order to accommodate those calculations that are necessary. I think there is a point made that short of perfect execution of every take off and landing there could result in pilot error and an incident or a crash, once again runway 25R meets FAA safety standards. Aircraft are required to adjust their weight for the runway length. As I mentioned, John Wayne Airport operates three times as many airline operations with less runway. We are blessed with a long main runway which, when rehabilitated, will always be used by the airlines with very rare exceptions. ...There are seven Saturdays that are planned in terms of using 25R as an alternative runway. All of the other days, runway 30 will be closed at 11 p.m. and then reopened at 6 a.m., so during the day those runways during the scheduled airline operations will be available throughout the construction with the exception of those seven Saturdays, potentially eight if there's rain involved. Mayor O'Neill: No, but if a Councilmember puts it on, we can certainly do that but it has been that the people in the back would have to accommodate all the people who would be coming back there and we do put this in place. Actually, I made that decision. If you'd like to change it, we can certainly bring it to the Council, but it was causing some congestion and also there were some things that were brought forward that were not appropriate. Councilwoman Reyes-Uranga: You guys have put me in a little awkward situation because I assumed that when he was asked to check with his Council representative, he did, and I assumed and went to the City Clerk and tried to do a lot of the leg work and make sure that it was OK and so. Mr. Mebust: [off mike] Mayor, I did give them the file [inaudible]. Councilwoman Reyes-Uranga: So I guess I need to know. So long as it's within three minutes and we've looked at it before they've presented it, I think maybe there are some guidelines that we need to revisit that and take a look at it. But I do have some concerns regarding this item, as the gentleman stated the safety and rerouting the airlines. Were there any other alternatives like maybe closing down for one day or two days? I know that's probably worse, not for the public I don't think but were there any other alternatives other than doing this? And part of the problem is that the lateness of flights, when you add it on to not only the impact for those people who have never really experienced those flight, and they're tremendously impactful when you use 25R. And the flights, I think I'm consistently getting calls about the lateness of the flights, so if we're talking about closing 30/12 from 11 [pm] to 6 [am], there have been flights past 10 [pm] and past 11 [pm] and past 12 [midnight] and so then that means they would be using 25R? Councilwoman Reyes-Uranga: I guess what I'm saying is that it is happening, and it continues to happen, and the impact of it happening on 25R is much, much more impactful to the residents. Either way [30/12 or 25R/7L] it's not appropriate but when it happens on the 25R runway, it's even more extreme, and I can only say that because every time it happens I get a call at my home and so I know when it happens, and it happens a lot. And it's a major concern that if this is going to be utilized, this alternative runway, then we have to do something to somehow guarantee or ensure that there's no late night flights, so that they're diverted some other place or that there's another plan. I mean I understand if there's extreme cases, but from the calls I've been getting, they haven't been extreme cases, they have been more the norm than not. Airport Manager Chris Kunze: ...Just starting with the options that we looked at in terms of construction. We looked at all nighttime closures and construction where there weren't any Saturday closures for the seven Saturdays we're proposing. What this would do would be to length construction by roughly 100%, so it'd be a two-year effort. It would also almost double the cost of construction, it would be millions of extra dollars. And also there's a real quality issue. FAA expressed major concerns by having the work done that way for technical reasons which we can get into. We also looked at just full runway 30 closure for 8 to 10 days. This was rejected because asphalt production is unable to guarantee the production rates necessary to support the completion of that runway. Also it would result in an increased number of air carrier landings and departures on runway 25R. By choosing Saturdays, that's the least busy day for airline operations and the all cargo flights do not operate on Saturdays. And also truck hauling traffic with this option would greatly impact locals. The option that we chose with the seven to eight closures, again, it reduces the construction by about a year, saves several million dollars in costs and the airlines were willing to modify their schedules to fly lighter aircraft, cancel some of their flights and the all cargos would not fly. I need to also I think reemphasize that runway 25R meets all federal standards. It's ten percent longer than John Wayne's runway and it is certificated under federal air regulation part 39 as an airline alternative runway, so it's not an unsafe operation. ...There's no difference in takeoff profiles on runway 30 or runway 25R. The aircraft use full takeoff power to a certain altitude, then they reduce to climb power. The runway is closer to that side of the community though, so it does appear as though it's a different profile, but it's actually the same profile. Regarding the late night activity, as you're aware our rates and fees schedule allows us to compensate an airline for all reasonable preapproved out of pocket costs for diverting to another airport. No other airport that I'm aware of in the world does that. We also will validate all parking for people who are on that flight, because they have been disadvantaged by having to be bused from another airport. I would propose that we go ahead and notify our airlines once again of this availability, and the importance especially during this construction phase of not operating after 11 o'clock [pm] and forward your concerns expressed tonight. And we'll do everything we can to push that option for them in the hopes to alleviate any late night flights. ...What we definitely need is to award a contract tonight so that we can begin the initial work on the runway. We all know very well the condition of the runway. We know that we've had some temporary closures due to the condition of the runway. That in itself causes a great distress to the residents. To continuously postpone even one more Council meeting this action would result in more of that activity occurring, as well as what's been agreed to by the airlines. They've gone to great effort to accommodate and work with us, and we are at the point that if we don't award it tonight, those weekend closures are going to have to be rescheduled to accommodate that. We need to get a lot of the preliminary work underway. Councilwoman Jackie Kell: ...What does the FAA say about any of this or our runway? What role do they play in this? Airport Manager Kunze: ...Again, runway 25R is certificated under federal air regulation part 139 as an airline runway. They are supportive of it. I would probably go on to state that they would probably not allow us to not have runway 25R available if runway 30 were to be closed. We're under our federal grant assurances. That runway is available for public use, and if we were to discriminate against a class of user and say that the airlines cannot use runway 25R, we could be running afoul of our grant assurances and other federal laws regarding discrimination against a class of aircraft. ...I'm just concerned that we're pushing forward something that is needed from a policy decision but yet we don't seem to have that same effort of dealing with what are we going to do to support our residents. Airport Manager Chris Kunze: ...I'd like to address some of the things we have done and I think the discussion is a good one. It gives us some further direction. We have discussed weekend closures at our airport advisory commission meetings for several months. We had a public meeting at the water treatment plant on August 14 to discuss airport issues that was widely advertised to the public and this [runway 30 reconstruction] was one of the three major items on that. We have had on our website since April a runway 30 rehabilitation set of information that has included this, so we have been doing outreach. We've also sent two and I believe possibly three notices to your Councilmembers with the weekly updates about the runway 30 project and the fact it will involve closures, so we have put that information out there. We definitely can put that in Council letters. I think that's a good suggestion. And we do have plans already, and we're going to continue to evolve those, to have basically massively communicate with the impacted public over the next nine months prior to the actual start of the closures. Councilwoman Laura Richardson: ...But based upon what you said, well we've talked about this at the airport [advisory] commission, we had a public meeting, remember these are people who normally don't have the planes flying over their house. So maybe the typical people who come out to these meetings who are aware, you've got now a whole 'nuther set of people that have very limited knowledge and understanding about this, so there has to be an expanded base of how we reach out to people. And again, I don't necessarily think a public meeting, people have children, they're working, we need to consider other forms of communication, direct communication, to the residents to let them know what's happening and I think we have a responsibility to do that. The Council vote to approve the contract as proposed by city staff was 6-2 (Reyes-Uranga and Webb dissenting, Lerch absent). Total discussion on the item ran roughly 38 minutes.